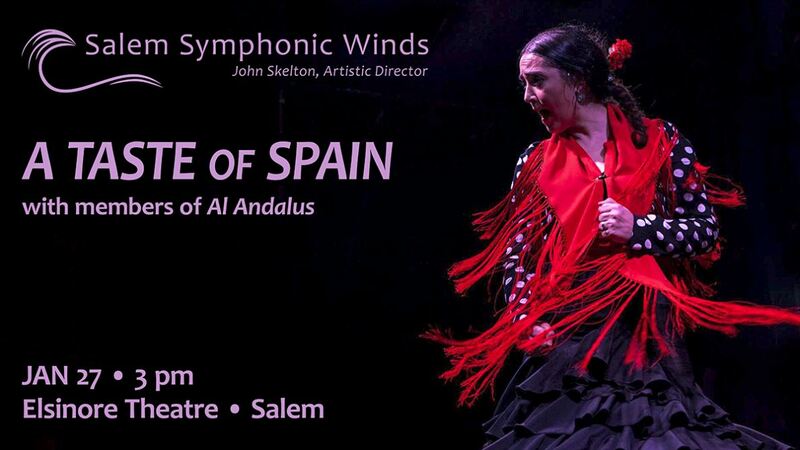 Salem Symphonic Winds presents "A Taste of Spain"
Join the women of Al Andalus Ensemble a moving musical portrait of Spain in song and dance. The afternoon will encompass Spanish popular music, ballet, opera, zarzuelas, flamenco and original works. in a uniquely Spanish program on Sunday, January 27 at 3 p.m.
at the Elsinore Theatre in Salem, Oregon. Musical selections will encompass Spanish popular music, ballet, opera, zarzuelas, and flamenco. The program will take audience members from the fire of Spanish dance to the mysterious and beautiful melodies of Spain's rich heritage. Flamenco includes singing, guitar playing, dance, and handclapping. It was developed through the rich cross-cultural interchange that occurred in southern Spain. Vocalist Emily Miles, dancers Laura Dubroca and Veronica Medina Cano join with flamenco guitarist Julia Banzi and the Salem Symphonic Winds in a dynamic musical celebration of Spanish cultures. The featured work is Duende, by Luis Serrano Alarcon. The multi-movement work explores the state of inspiration and supreme perceptiveness, almost magic, which is achieved in flamenco by the performer on rare occasions. The work will feature Casey Younger in a dramatic bass guitar solo, and flamenco dancing by Veronica Medina Cano and Laura Dubroca. Also featured will be musical selections from the zarzuela, a dramatic art form which includes song, dance, speaking and instrumental interludes and Spanish ballets. Selections from La Vida Breve, a zarzuela by Manuel de Falla, concludes with the final tragic dance by the young gypsy Salud. The Intermezzo from La Boda de Luis Alonso by Gerónimo Giménez will feature both Spanish dancing and a virtuosic castanet solo by Veronica Medina Cano. The Ritual Dance of Fire, an audience favorite dance feature from the ballet El Armor Brujo by Manuel de Falla, will be danced by Laura Dubroca. Emily Miles brings deeply soulful interpretations to songs. She will join flamenco guitarist Julia Banzi in a new treatment of Procuro Olvidarte by Manuel Alejandro and Ana Magdalena, and a unique interpretation of the folk song Wayfaring Stranger. The band will include the arrangement of the song by Chrisopher Nelson, director of bands at McNary High School. Rounding out the program will be Roma by Valerie Coleman, Arabesque by Samuel Hazo, and the pasodoble España cañí, a Spanish Gypsy dance by Pasqual Marquina Narro. John Skelton will conduct the concert and offer a pre-concert talk about the concert music at 2 pm on the Elsinore Theatre main floor. The Salem Clarinet Ensemble will perform a few selections following the talk.